Well it’s official. The Partai Aceh candidates for Governor and Vice Governor will rule Indonesia’s most fractious province for the next five years. Their election campaign was a strange mix of proto-militarism and religious fervour. At every rally, hundreds of the young men who are the party’s most fanatical supporters stood in serried ranks in red, black and white “camouflage” uniforms, saluting the candidates, one of whom is a rather homey doctor who has spent most of his adult life in Sweden. They (and I) listened also to sermons about how Partai Aceh would keep the province free of “kaffir” religions — anything that is not Islam, effectively. There were strange digressions about protecting the territory from the Jews, although to my knowledge the Jewish community is, uuuum, somewhat under-represented in Indonesia as a whole, let alone in Aceh. As he formally acknowledged his election, the doctor from Sweden, Zaini Abdullah, said he would seek to implement a “purer” form of Islamic Sharia law. His bitter rival in this election, former governor Irwandi, is seen by some to have sold out because he refused to sign a bill implementing Sharia law, finding some if its provisions too harsh. Stoning adulterers to death, for example. I’ll be interested to see how Zaini Abdullah negotiates this one. His running mate, the former guerilla commander Muzakir Manaf (who looks like he’s been sent over to Party headquarters by Central Casting), is widely known to have at least five wives. That’s one more than is allowed by Sharia law (which, says Zaini, “is about how to educate our youths about what is right and wrong”). Technically, then, the Vice Governor is an adulterer. Will Partai Aceh’s dedication to purity put it’s own number two at risk of death? Watch this space. Poor David Cameron; something always seems to steal his thunder. During his visit to Indonesia today, it was two huge earthquakes in Aceh. I’m in Aceh just now, and was watching his press conference on Indonesian TV when the room started to shake and we had to tear ourselves away from his platitudes. The UK Prime Minister is reportedly looking for business for UK companies. If investment decisions were based on need, or on the impact they might have on the daily lives of poorer people, Cameron might encourage UK businesses to turn his blah blah about bridge-building into something more concrete. In the last couple of months I’ve been in two of Indonesia’s richer provinces, Aceh in the extreme west, and Papua in the far east. In both, there are shocking lapses in investment in infrastructure — lapses that make life miserable for kids on their way to school, women on their way to sell vegetables in the market, people trying to scrape together a living running motorbike or pick-up truck taxi services. The high-wire act that passes for a bridge near Tangse, in northeast Aceh, shown in the video is the remains of a wooden bridge washed out by a massive flash flood in early 2010 — what the locals call “our tsunami”. Although there are still millions of dollars sloshing around in unspent funds donated for reconstruction after the 2004 tsunami, nothing had been done to fix this bridge 18 months after its evaporation. You’ll have to excuse the shaky filming — I had to keep one hand on the wire as I crossed…. This other photo was taken in Wamena, in the stunning central highlands of the country’s richest province, Papua. 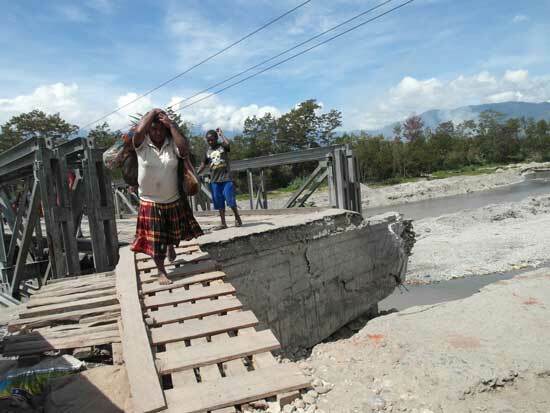 Wamena is the main town in the highlands, and this bridge is on the main road out of town, linking the hospitals, markets and high-schools of town with the rural hinterlands. Or rather not linking them; motorbikes can get across but it has been months since a truck or minibus made the leap. It’s sobering to see the people of Aceh’s reaction to today’s earthquakes, even in the hills where I am just now and where there’s no risk of a tsunami. The girl I was talking to went so faint that she to had to be helped out of the building for the second earthquake, 8.8 on the Richter scale. A little later, still shaky, she told me that she had lost several family members in the 2004 tsunami. She also agreed with someone’s only half-joking suggestion that this was the earth’s reaction to Monday’s elections in Aceh. These were comprehensively won by Partai Aceh, the political offspring of the GAM guerilla movement improbably directed out of Sweden. Though they’ve been widely accused of election-related manipulation, violence and intimidation, Partai Aceh played the Peace card in this election. But they played it upside down. Rather than say: “if you vote for us, we’ll keep the peace”, the rank and file, at any rate, were saying: “if you don’t vote for us, your precious peace will be no more”. I rather suspect Partai Aceh would have won even without the scare tactics. But Earthquake-Girl’s reaction to my idiocy (as I wandered back in to the shaking building to get my computer) reminded me of this fact: the more people know the bitter taste of fear, the more effectively it controls their behaviour. The people of Aceh spent the 15 years to 2005 finding corpses by the roadside in the morning, trembling at midnight knocks on the door from guerillas and soldiers alike, being shaken down for cash, rice, a motorbike. They’ll vote for anything that avoids a return to that. Stop Money Politic...! This poster from the elections commission in East Aceh, Indonesia, has the thought bubble: "Won't he have to use corruption to get back the money he's spent?" It’s local election season in many areas of Indonesia. That means posters of well-fed used car salesmen promising vaguely to fight corruption and enrich the “rakyat”, the majority of Indonesians who live from day to day or month to month. It also means that towns and villages are filled with “Tim Sukses” — swarms of volunteers who try to get the vote out for their candidate, often with the help of envelopes of cash. Here’s my question: why does money politics work? I put the question in a slightly more direct form to someone in Aceh who was cross because she’d been offered only 100,000 rupiah — less than US$ 11 — for her vote. “I got that in 2006, and there are more candidates this time, all of them making offers. Why would I give away my vote for just 100,000?” Why, I asked her, didn’t she just take 100,000 from all of the candidates, and then vote the way she would have voted anyway? She looked shocked. “If I’ve promised my vote, I have to deliver my vote!” In other words, money politics works because enough people are honest in their corruption. 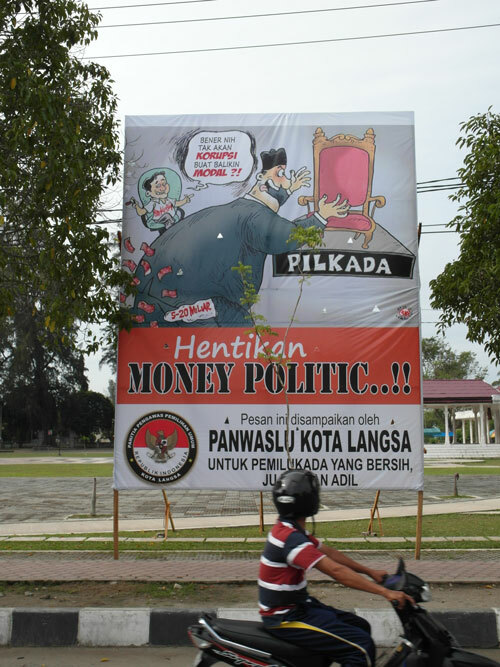 As this poster from the election oversight commission in the East Aceh town of Langsa suggests, the vast spending on campaigns, including vote-buying, leads to a cycle of corruption. Elected leaders resort to graft just to get back the cash they’ve spent. Sometimes, the payback is in contracts, not cash. But every which way, it means public money is badly spent. This report from the World Bank gives a pretty clear picture of how it all works. It refers to the last round of elections in Aceh, the rich Westernmost province of Indonesia that teeters perpetually on the brink of independence, but — pace the separatists — there’s virtually nothing in it that is not just as true of the rest of Indonesia. The exception is wrapped up in the final point about voter behaviour: intimidation. 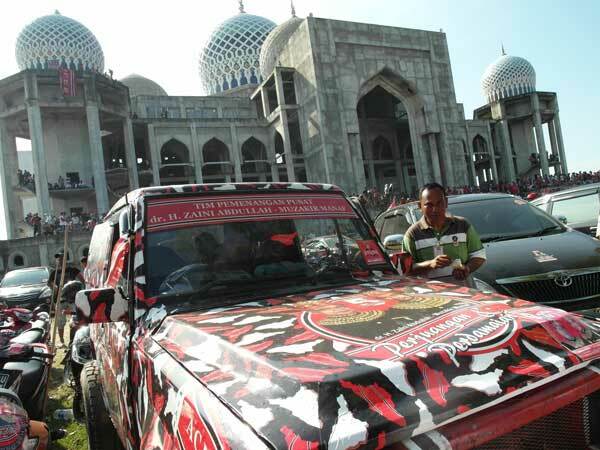 In Aceh, people are talking about “Terror Politics” as well as “Money Politics”. Last week I made a giant leap from the tuna fishing grounds by the Philippine border to the far West of Indonesia to witness the local election campaign in Aceh. I didn’t see it because the elections have been postponed for the third time, in part because the fractious former separatists, unhappy with the current governor who is also a former separatist, have been obliquely threatening unrest if Jakarta doesn’t roll over and do everything it can to undermine the incumbent. I can’t say that it is their camp, Partai Aceh, that was behind the drive-by shooting at the house of the Governor’s Tim Sukses head last week. But party activists in the local coffee shop were not denying it when I reflected that a postponed election increased their chances of getting “their man” — a crusty old soul who has spent much of his adult life in exile in Sweden — elected. If this all sounds complicated, it is (there’s a good run-down of the issues from the International Crisis Group and more in Inside Indonesia). According to a former candidate for mayor in Langsa, home to the anti-money politics poster pictures above, terror Politics is the order of the day, at least in rural areas. “If you stay in a village for a week before the elections, I guarantee you’ll get a knock on the door in the middle of the night.” In an area where a knock on the door at night meant near certain death for over 15 years, either at the hands of a shadowy group of thugs and rebels who eventually gelled into Partai Aceh, or at the hands of the Indonesian army that fought to suppress them, it’s pretty persuasive. Even more persuasive, perhaps, than 100,000 rupiah.